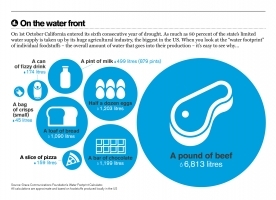 Infographic: A scary perspective on America’s water consumption from Delayed Gratification, the Slow Journalism magazine. 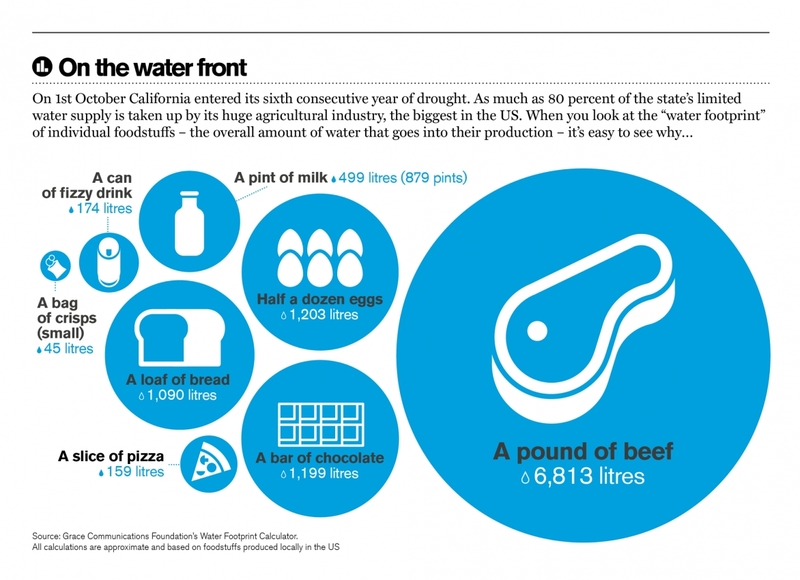 On 7th April 2017, California’s governor, Jerry Brown, declared that the state’s drought state of emergency was over. The severe water shortage across the western United States had lasted for five-and-a-half years and, according to a number of studies, was brought on by changing weather patterns associated with La Niña (a periodic drop in the water temperature of the Pacific) and was exacerbated by global warming (2016 saw California’s hottest summer on record). Adding to the state’s water woes is its ravenous demand for H20, both from its thirsty population of more than 39 million and its parched agricultural sector – a level of consumption that is putting immense pressure on natural resources such as the great Colorado River, which some experts have warned could be in danger of drying out in decades to come.